I never thought I'd get so emotional reading a legal opinion, but it's happened, and not just to me, thanks to Paolo Mengozzi, Advocate General at the Court of Justice of the European Union. Mengozzi was called to give his opinion on a case which has as its protagonists a Syrian family (mother, father and three children from Aleppo) and the Belgian government, a case which could signal a breakthrough – positive for once – in Europe's asylum policy. All will depend on the Court, whose verdict will be delivered on 7 March. If it follows the reasoning of the Advocate General, not only Belgium, but all European countries will be obliged to offer legal means to enter EU territory when Syrians request it. The story goes back to October 2016, when the family in question requested a humanitarian visa from the Belgian embassy in Lebanon. With this they hoped to enter Belgium legally and request asylum, but Belgian authorities promptly rejected the request. The family went to the Conseil du contentieux des étrangers (CCE, the Belgian commission for disputes involving migrants), which was already involved in a similar issue. Theo Francken, under-secretary for immigration and asylum, had in fact just refused a humanitarian visa to another Syrian family, despite the CCE's three appeals . In the last few months this second case has caused huge controversy. When the Court of Appeals in Brussels upheld the CCE's decision, condemning Belgium to pay €1,000 for each day of delay to each member of the family, Francken not only refused to issue the visas, but also refused to pay. In December, his party, the N-Va (New Flemish Alliance, nationalist) took a confrontational attitude, launching a campaign against “activist judges”, accusing them of wanting to “open the borders” and being “disconnected from reality”. 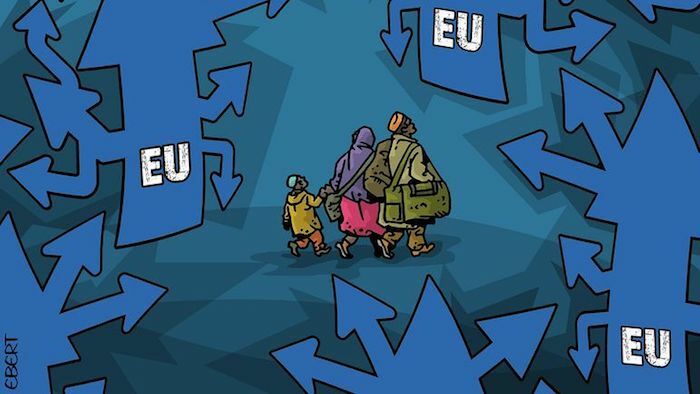 Considering the circumstances, the CCE thought better of leaving the other Syrian family to the mercy of Francken, instead turning to the European Court of Justice to ask how the current rules governing humanitarian visas should be interpreted. Given the importance of the case, the Court decided to submit it to examination by its fifteen judges, with recourse to “urgent preliminary reference”. On 30 January a public hearing was held, during the course of which Belgium, supported by representatives of thirteen other European governments and by the European Commission, defended its position in front of the Court and Paolo Mengozzi. According to the Treaty of Rome , the EU’s founding text, “it shall be the duty of the Advocate General, acting with complete impartiality and independence, to make, in open court, reasoned submissions on cases brought before the Court of Justice, in order to assist the Court in the performance of the task assigned to it”. The Advocate-General's opinions are non-binding, but according to a recent study , the Court follows his advice in almost seventy per cent of cases. On 7 February, Paolo Mengozzi presented his conclusions . With stringent, impassioned reasoning, he sided with the Syrian family, dismissing all of the Belgian government's objections. Yes, the Court of Justice has the competence to address this case (the Belgian government had placed its hopes on the contrary), and no, the EU Visa Code is not limited to allowing member states to issue, in exceptional circumstances, a visa for humanitarian reasons to people who would usually not have the right to enter European territory. It is not simply an “option”, observed Mengozzi, but rather, in certain cases, an obligation, because when European Union law is enacted (for example, when applying the Visa Code), member states are obliged to respect the Charter of Fundamental Rights . And the Charter not only prohibits inhumane or degrading treatment by member states, but also obliges them to “take reasonable measures” to ensure that people do not suffer such treatment at the hands of others. “In other words”, explained the Advocate General, “while staying within its margin of discretion, the member state in question should come to a decision which does not violate the rights granted by the Charter”. From the outset, Mengozzi could barely hide his irritation at the sight of fundamental rights being trampled by European governments as if they were minor, optional rights (while they are actually “actual and effective”, he emphasised, not “theoretical or illusory”). Going on examining the case at hand and the Belgian government's explanations, his irritation turned to rage. “To be perfectly clear, what other options do they have” – father, mother, and three infants? “Stay in Syria? Inconceivable. Trust some unscrupulous traffickers, risk their lives trying to land in Italy or Greece? Unacceptable. Resign themselves to becoming illegal immigrants in Lebanon, with no hope of obtaining any international protection, running the risk of being pushed back into Syria? Inadmissible”. The Belgian government cannot be ignorant of these considerations, Mengozzi observed, and it is therefore knowingly putting the family at risk of inhumane treatment, depriving them of exercising their legal right to international protection in Europe. Mengozzi also took the occasion to stress that offering legal entry in certain circumstances contributes to the fight against human traffickers’ criminal networks. If I had Mengozzi here in front of me, I'd hug him. And it's no accident that this appeal to respect the values and laws upon which the Union was founded comes from a person born in 1938. A man who, in contrast to Francken and so many other current European leaders, has experienced Europe in war-time, a Europe of civilian slaughter and displacement. On 7 March the Court will give its verdict. Will it affirm the position of its advocate-general? Will it call the member states, who have always considered humanitarian visas a privilege granted only rarely and arbitrarily to order? Or will it distance itself from Mengozzi, accepting the callousness and duplicity of the European governments, undermining even further one of the few instruments of international protection? Further, an instrument threatened by the reform of the Visa Code, initiated in 2014 by the Commission and currently stalled by an interinstitutional conflict over the question of humanitarian visas: the Parliament requires that the issuing procedure be simplified, while the Commission and Council would prefer to see it disappear from the legislation. Between the positions of Mengozzi and the Belgian government, the Court could choose a compromise. This would constitute a defeat, however, for what remains of the right to asylum in Europe. This right, like music, lives on interpretation, but some interpretations are more influential than others. Pronouncing its decision, the Court will not just be providing its interpretation of certain articles in the Visa Code. With its decision it will either reward or penalise the behaviour of European governments and clarify whether fundamental human rights should be considered “actual and effective”, as Mengozzi argues, or just an illusion.